مظلومی, مهرداد, میرزایی, مریم. (1396). بررسی رابطه بین ضریب دید به آسمان و پوشش گیاهی، نمونه موردی: پارک لاله شهر تهران. معماری و شهرسازی آرمان شهر, 10(19), 257-270. مهرداد مظلومی; مریم میرزایی. "بررسی رابطه بین ضریب دید به آسمان و پوشش گیاهی، نمونه موردی: پارک لاله شهر تهران". معماری و شهرسازی آرمان شهر, 10, 19, 1396, 257-270. مظلومی, مهرداد, میرزایی, مریم. (1396). 'بررسی رابطه بین ضریب دید به آسمان و پوشش گیاهی، نمونه موردی: پارک لاله شهر تهران', معماری و شهرسازی آرمان شهر, 10(19), pp. 257-270. مظلومی, مهرداد, میرزایی, مریم. بررسی رابطه بین ضریب دید به آسمان و پوشش گیاهی، نمونه موردی: پارک لاله شهر تهران. معماری و شهرسازی آرمان شهر, 1396; 10(19): 257-270. 1استادیار شهرسازی (طراحی شهری محیطی)، دانشکده معماری و شهرسازی، دانشگاه آزاد اسلامی قزوین، قزوین، ایران. 2کارشناسی ارشد برنامه ریزی شهری، دانشکده معماری و شهرسازی، دانشگاه آزاد اسلامی قزوین، قزوین، ایران. ضریب دید به آسمان یکی از متغیرهایی است که در تشکیل جزایر گرمایی شهری نقش دارد و بیانگر نسبت تابش دریافتی یک صفحه مسطح به تابش تابیده از کل محیط تابنده نیم کره ایست و کمیتی بدون بعد بین صفر تا یک است و در زمین کاملاً صاف به واحد میل م یکند. حال آ نکه مکان های دارای مانع، مانند ساختما نها و درختان، موجب کاهش SVF به طور متناسب می شوند. هدف اصلی این پژوهش بیان رابطه میان ضریب دید به آسمان و پوشش گیاهی با استفاده از دمای سطح در پارک های شهری است. در این پژوهش، مطالعه میدانی در 15 ایستگاه پارک لاله شهر تهران در 5 روز بهاری انجام شده است. تصاویر از طریق دوربین با لنز چشم ماهی استخراج و ضرایب با برنامه محاسباتی Sky View Factor Calculator و دمای سطح نیز با دماسنج 2-WT اندازه گیری شده است. در فضای درون پارک لاله همبستگی بین ضریب دید به آسمان و دمای هوا سطح معنی دار و مثبت بوده است. همچنین همبستگی بین تفاوت دمای هوا و سطح با ضریب دید به آسمان تنها در ایستگاه FL معنی دار است. سپس همبستگی بین دمای سطح و میانگین قطر تاج پوششی بررسی شد و نتایج حاکی از عدم معنی داری همبستگی بود. در نهایت مشخص شد که میزان همبستگی بین دما و اندازه برگ پوشش گیاهی در فضای درون پارک لاله معنی دار بوده است. گونه های پهن برگی چون ارغوان، چنار، سنجد، ترون و نارون و پوتوس در ترکیب با گونه های سوزن یبرگ بید مجنون، سرو شیراز، سرو نقره ای بهتر از سایر گونه ها می توانند دمای سطح را خنک نمایند. یعنی اکثر گونه هایی که در ایستگاه FL به کار رفته اند. Bar-Haim Y., Fox N. A., Benson B., Guyer A. E., Nelson E. E., Perez-Edgar K., Pine D. S., & Ernst M. (2009). Neural Correlates of Reward Processing in Adolescents with a History of Inhibited Temperament. Psychological Science, 20 (8), 1009-1018. Becker, P., Erhart, D. W., & Smith, A. P. (1989). Analysis of Forest Light Environment Part I. Computerized Estimation of Solar Radiation from Hemispherical Canopy Photographs. Agriculture and Forest Meteorlogy, 44, 217-232. Brown, M. J., & Grimmond, C. S. B. (2001). Sky View Factor Measurements in Salf Lake City: Data Report for the Do CBNP URBAN Experiment October 2000, International Report Los Alamos National Laboratory Los Almos. New Mexico. LA- UR- 01- 1424, N.
Bruse, M., & Fleer, H. (1998). Simulating Surface-plant-air Interactions inside Urban Environment with a Three Dimensional Numerical Model. Environmental Modeling and Software, 13, 373-384. Chapman, D.W. (2002). Management and Efficiency in Education: Goals and Strategies. Series “Education in Develop Asia” Manilla: ADB and Hong Kong. Comparative Education Research Center. University of Hong Kong. Gal, T., Lindberg, F., & Unger, J. (2007). Computing Continuous Sky View Factors Using 3D Urban Raster and Vector Database Comparison and Application to Urban Climate. Theoretical and Applied Climatology, 114-123. Grimmond, S., & Souch, C. (2006). Applied Climatology: Urban Climate. Progress Physical Geography, 30, 270-279. Leung, K. S. & Steemers, K. (2008). Estimating Average Sky View Factor of Urban Surfaces with Simple Geometric Parameters. The 25th Conference on Passive and Low Energy Architecture, Dublin. Leung, Y. K., Yip, K. M., & Yeung, K. U. (2004). Relationship between Thermal Index and Morality in Hong Kong, Meteorological Application, 15(3), 399-408. Lindberg, F. & Holmer, B. (2011). Goteborg Urban Climate Group Department of Earth Science, University of Gothenberg, User Manual, Version 1.1. Matzarakis, A., Rutz, F., & Mayer, H. (2006). Modeling the Thermal Bio Climate in Urban Areas with the Rayman Model. The 23rd Conference on Passive and Low Energy Architecture, Geneva, Switzerland, 449-453. 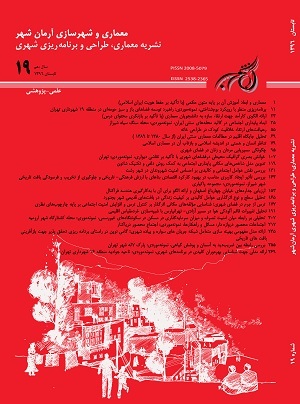 Monam, A., Behzadfar, M. (2011). The Impact of Sky View Factor on Outdoor Thermal Comfort, Armanshahr Architecture and Urban Development Journal, 5, 23-34. Oke, T. (1993). Boundary Layer Climates, 2nd ed. Cambridge: Cambridge University Press. Oke, T. R. (1981). Canyon Geometry and the Nocturnal Urban Heat Island: Comparison of Scale Model and Field Observations, International Journal of Climatology, 1, 237-254. Oke, T.R., Johnson, D. G., Stey, O.G. & Watson, L.D. (1991). Simulation of Surface Urban Heat Island under Ideal Conditions at Night- part 2: Diagnosis and Causation. Bound Layer Meteor, 56, 339-358..
Rouhani, G. (2004). A Guide to the Ornamental Trees in the Landscape, Tehran: Aeezh Press. Shashua–Bar, L., Pearlmutter, D., & Erell, E. (2009). The Cooling Efficiency of Urban Landscape Strategies in a Hot Dry Climate, Landscape and Urban Planning, 92, 179-186. Steyn, D. G. (1980). The Calculation of View Factors from Fisheye-lens Photographs, Atmosphere-Ocean, 254-258. Svensson, M. K. (2004). Sky View Factor Analysis–implications for Urban Air Temperature Differences, Meteorol, Appl., 11, 201- 211. Unger, J. (2004). Intra-urban Relationship between Surface Geometry and Urban Heat Island: Review and New Approach, Climatic Research, 27, 253-264. Upmanis, H. & Chen, D. (1999). Influence of Geographical Factors and Meteorological Variables on Nocturnal Urban-park Temperature Differences, Climatic Research, 13, 125-139. Upmanis, H., & Chen, D. (1999). Influence of Geographical Factors and Meteorological Variables on Nocturnal Urban-park Temperature Differences- a Case Study of Summer 1925 in Goteborg. Sweden, Climate Research, 13(2), 125-139. Watson, I. D., & Johnson, G. T. (1987). Estimating Person View-factor from Fish Lens Photographs, International Journal of Bi-Meteor Ology, 32, 123-128. Watson, I. D., & Johnson, G. T. (1987). Graphical Estimation of Sky View-factor in Urban Environments, International Journal of Climatology, 7, 193-197. Yamashita, S., Sekine, K., Shoda, M., Yamashita, K., & Hara, Y. (1986). On Relationships between Heat Island and Sky View Factor in the Cities of Tama River Basin, Japan. Atmospheric Environment, 20, 681-686.